"Finely engineered show full of glitz"
The London Palladium is hosting a tribute to Frank Sinatra, 65 years after his first ever concert in the UK. He first performed at the venue in 1950, an evening which started the country’s love affair with his legendary music. It also celebrates what would have been his 100th birthday. 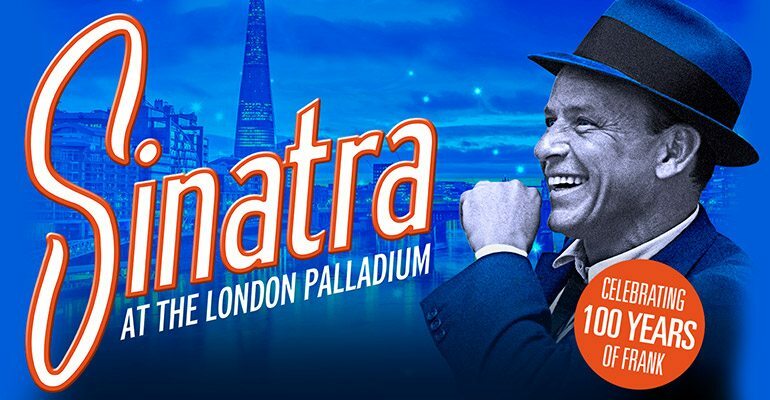 The show, simply called ‘Sinatra’, features a 24-piece orchestra playing some of his biggest hits including 'My Way', 'Fly Me to the Moon' and 'I've Got You Under My Skin'. 20 dancers will accompany the music to make it a visual spectacular. There will also be some rare recordings, some never before seen footage of Sinatra’s performances, and some interviews from his long career. Come and see this fitting tribute to Sinata and celebrate his musical legacy at the London Palladium from 10th July 2015. Amazing show. I was too young to see Sinatra live . This was definitely the next best thing. 5 stars for the team who put it together, the dancers and the amazing band. So lovely to see a big band again. When Sinatra turned to the band at the end . It made the hairs on the back of my neck stand up. What a lovely thought as often they are not recognised at the end of a show these days. Sinatra's family must be very proud of the show. Thank you so much!! Have been twice now. Fantastic show. Very moving at times and what a superb orchestra and great dancers.Worth going for the musicians alone. I can't understand some of the negative comments. Well recommended. We had front row seats and had a restricted view. RV should be put on site so you know. we could not see anything at back of stage very disappointing. But a really good show. Having read some of the reviews here I had reasonably low expectations. We were taking our 12 and 10 year old children during Kidsweek and I expected them to spend the evening shuffling in their seats. However, we thoroughly enjoyed the show. The dancers were excellent, the orchestra amazing, and the clips of Sinatra outstanding. I came away wanting to read his life story and find out more about him. A thoroughly entertaining evening. Clearly there are some seats in the theatre that aren't as good as ours (we were in the Dress Circle row D) but I think that's a separate issue and the musical shouldn't be judged on that. I really enjoyed every minute of this tribute to Frank Sinatra. The orchestra and the dancers were fluid, vivacious and stable in this unique performance. Scenography, screenplay, costumes and the ability of the performers were enchanting by creating the impression that this charismatic singer is still among us with his unfading fame. It has been a cathartic experience. A very good day. I would like to see it one more time just to make sure l didn't miss any of it. Very disappointed. I took my daughter to the show for her birthday but basically saw half a show. The screen that came down with pics was ridiculous as we could only see the bottom half from where we were sitting in row F in the upper circle, so very disappointed. Awful. The director should have tried sitting in row U. Most of the time we only saw the lower half of the singers and we certainly know that Sinatra has good teeth! We left with several other people during the second half. And! when Sinatra clicked his fingers in the first half they were out of sync and sounded like two drum sticks being hit together. A wonderful night featuring a fantastic orchestra and great dancers blended pretty much seamlessly with archival vision and audio of some of Sinatra's great performances and reminiscences across his long career. A real treat for his myriad of fans, but perhaps not such a thrill for those who aren't; a must for anyone who enjoys seeing and hearing what can be done with digital technology. Very disappointing would not recommend - expect better from the Palladium.